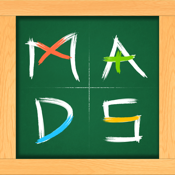 Math MADS is an ideal math practice tool that can be used by students at home or school to improve the simple math skills of addition, subtraction, multiplication and division, in a fun and engaging manner. It supports upto 5 students in this free edition, with progress details presented in tabular format and saved over time,. It can be used in a time bound manner or number-of-cards bound manner in each session. Both female and male voice overs have been provided to give it a nice touch. This can be turned off in the settings and all student records can be removed as well. Once the student gains confidence, he/she can try out advanced features like larger digit operations, negative numbers etc. Ideal for schools and teachers to keep track of student progress over time. Keeps students engrossed in this fun activity of math learning.